We now offer a 4 Day Camp option for junior high and high school students - together! WE will have teams of junior high students that will be working on a site while a team of junior high students works at another site, all at the same camp! Thank you for visiting our site! 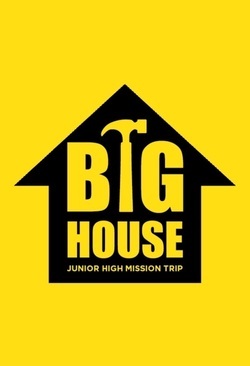 BIG HOUSE is an acronym which stands for Believing in God, Helping Others Understand through Service Everywhere. BIG HOUSE Texas is a 501(c)(3) non-profit organization with offices in Deer Park, Texas. Our mission is "To prepare youth and adults to be the hands and feet of Jesus Christ, by providing opportunity to be in mission to churches in need everywhere." We want to give opportunity for youth to come together and grow in their Christian experience, through all aspects of our mission trip, whether it be on the work site, or in fellowship with one another. Mission experiences include participants who have completed the 5th through the 8th grade from all over Texas. ***We also have a new 4 Day camp experience for students who have completed 5th-12th grade! These youth come together with the help of adults to work on churches and homes of those who are in need, and are unable to do the work themselves. The cost per participant is $135 for Thursday - Sunday work camp, and $150 for Wednesday - Sunday camp. At BIG HOUSE, the students and adults come together on Thursday, meet their teams and begin planning work on their selected site. It could be a home they are painting, or a church they are cleaning and repairing, or perhaps it's working in a church food pantry. The work sites are varied and endless. In the evenings everyone will relax after a wonderful dinner at the evening activities. You might be swimming or playing messy games regardless, there is fun to be had by everyone. This experience wraps on Sunday morning with worship at the host church. BIG HOUSE is a very busy and spiritually fulfilling 4 days for these junior high students. Please plan to join us in service to others this summer!